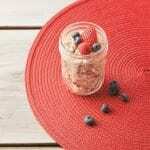 Berry Blast Overnight Wheats | JPMA, Inc. In small bowl stir together cereal and basil. Stir in yogurt and fruit. Tightly cover and refrigerate for 8 to 48 hours.